Last gig ever! It's gonna be epic! Watson gained national fame in the '80s as the fresh-faced, young front-man and guitarslinger for Smoke Shop. The band made two charting albums, had several radio hits, opened for international blues legends like Koko Taylor, Robert Cray, George Thorogood, and The Fabulous Thunderbirds. They toured tirelessly earning Watson a place alongside the likes of Midge Marsden, Hammond Gamble and Rick Bryant as one of this New Zealand's best blues interpreters. In 2009 Watson won first place in the 2008 International Songwriting Competition (Blues), judged by artists and industry-types like Tom Waits, James Cotton, and John Mayall. 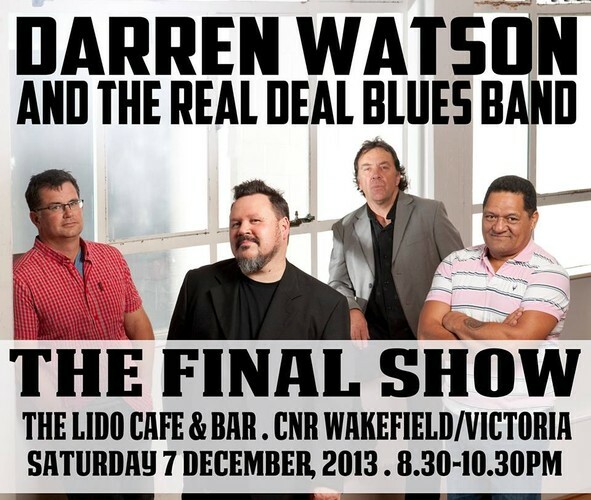 This year Darren Watson & The Real Deal Blues Band are performing their first international dates at the Australian Blues Festival in February and Blues On Broadbeach (Gold Coast) in late May. With his superb album Saint Hilda's Faithless Boy garnering stellar reviews in American publications, including prestigious US magazine Blues Revue, it may not be long before many New Zealand blues fans will be saying “I knew him when."